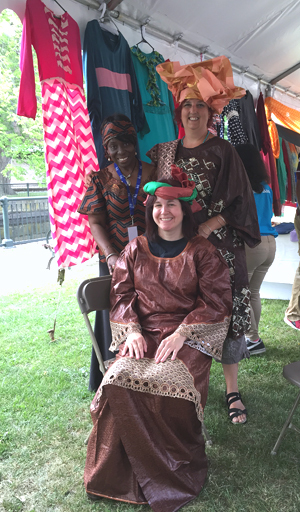 When Maggie Holtzberg asked me if I would participate in the Lowell Folk Festival, I was excited to be able to share my fascination for the “unstitched garment” with visitors to this unique festival. It has been fifteen years since I moved to Massachusetts from India. While living in India, I had been deeply entrenched in working with hand woven, hand block printed, embroidered fabrics, for close to 15 years. I still continue to stay connected with craft communities in India and keep looking for ways to share my love of South Asian textiles with communities here in the US. 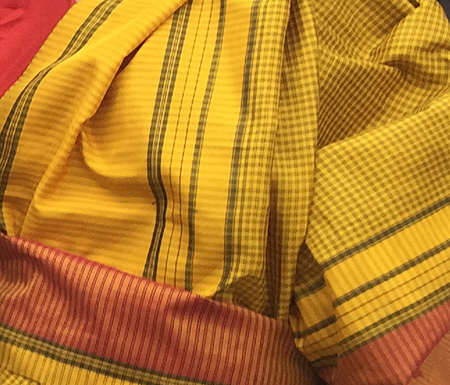 On the day before the festival I pulled out all my favorite saris from my wardrobe — Ikats, Jamdanis, Benaresi, Mysore silks and Kanchipurams. To this collection I added a suitcase full of incredible hand spun, hand woven contemporary saris from “Taan Baan” a label well respected and known for revivals, and all my books on saris including the one I contributed to, Saris: Tradition and Beyond. I loaded my little Volkswagen beetle on the morning of the festival. On my way to Lowell, I stopped to pick up Jaiya Aiyer, a truly remarkable young girl who was introduced to me a few months earlier as a student of Indian dance. The plan was for us to demonstrate the folding and wrapping of the sari and discuss the ways the unstitched garment could be worn in myriad elegant ways. Jaiya had worn the sari as a costume for her Bharatanatyam dance recitals in the past and was very familiar with the regular six yard wearing style. When Jaiya got into the car I was thrilled to see her wearing a beautiful traditional “Narayanpet” from Andra Pradesh, which she had borrowed from her mom’s wardrobe. 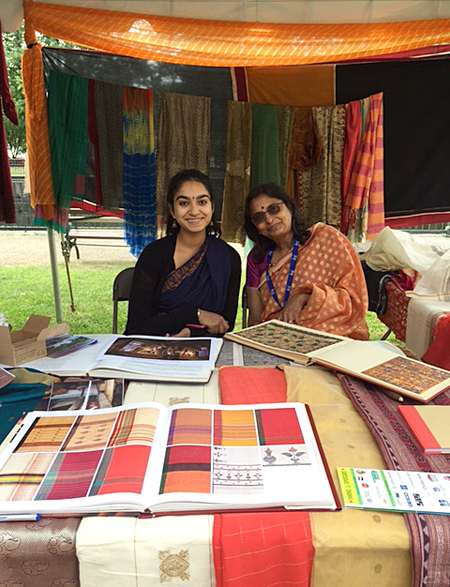 As soon as we arrived at the Lowell festival we got busy hanging up the saris and stoles in our tent and putting up the posters I had made. 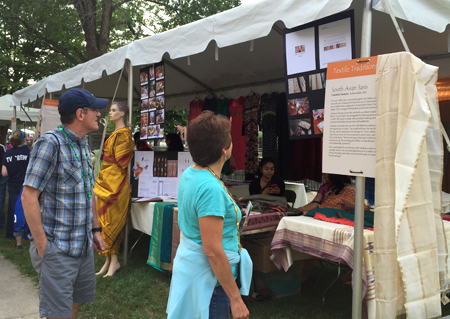 In preparation for meeting festival goers, we continued to chat about saris — their structure and materials, the weavers and printers, the wearers and the community. 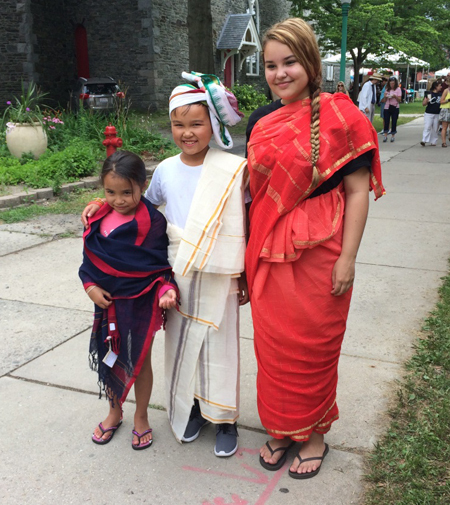 I dressed the mannequin, so kindly lent to us by Lowell National Historical Park, in a white cotton Kerala sari and our first visitors watched with amusement as I wrestled with the mannequin, to turn the skinny blond lady into a traditional South Indian “mohini attam” dancer. It wasn’t long before we overheard friendly chatter coming from the other end of our tent. 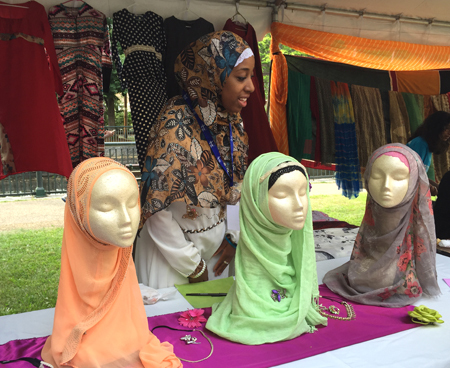 We soon learned that our tent neighbors were Liberian Rosaline Accam Awadjie who had arrived with brightly colored Dutch wax prints fabrics for African head wraps and Qamaria Amatal-Wadud, a young woman from western Massachusetts with her fine Islamic hijabs. We spent two days sharing wonderful stories and experiences with visitors explaining the wearing style they would try on, the materials, the variable textures. The way the sari is worn conveys a wealth of cultural information about an Indian woman- her religious belief, marital status, wealth, or social standing. Visitors asked several questions on rituals, customs and culture. These exchanges did not stop with just a greeting — something that I have experienced, having participated as a vendor of Indian hand crafts on several occasions. Here, people were interested in knowing more about the culture and story behind the cloth, the women who wore them, and the weaver who wove printed or painted them. We used the charts I had made to explain the process of hand spinning, weaving and printing. 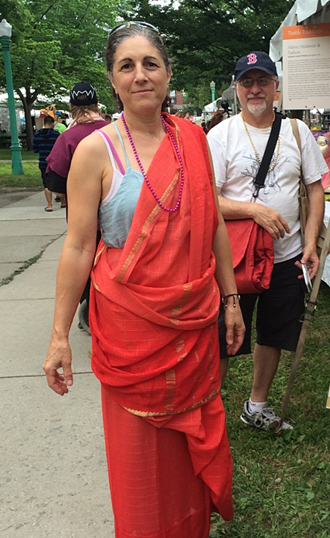 At the end of day, Sunday, a woman who had visited the day before came back with a sari in her hand. She had gotten it as a gift years ago and wanted to know if I knew which part of India it might be woven. “I think Bengal,” I told her, looking at the fine cotton thread work and indeed there was an old label stamped with a shop’s name in Bengal! Another enthusiast we dressed in a sari wanted photographs of herself after she been dressed with an African headwrap; by combining the two she made a unique fashion statement! 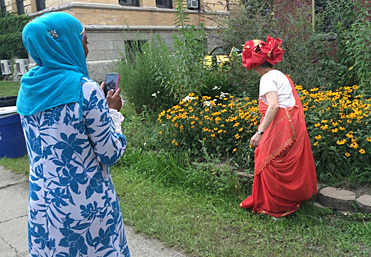 Below you see Qamaria taking a photo of this woman walking past a patch of black-eyed Susans. 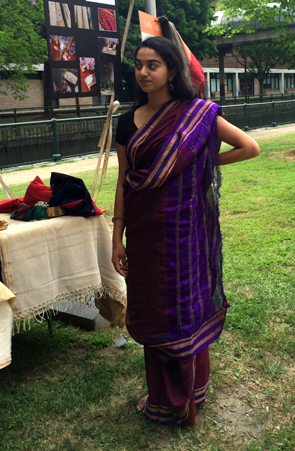 Both Jaiya and I enjoyed our two days of interactions and were happy to have shared the story of the unstitched garment, literally the “whole nine yards” with visitors to Lowell.